Home Bridal Fashion What do I do with this Bridesmaid dress or Saree? Did you ever wonder why we have bridesmaids, all dressed the same, in most weddings? 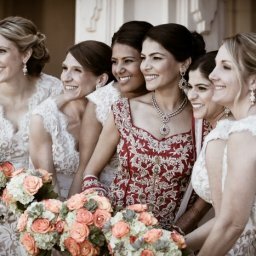 The tradition has now spilled over to Indian-American weddings, with interesting variations like similar sarees instead of dresses. So now that you have been to a couple of weddings as a bridesmaid, and have those lavendar dresses hanging in the back of your closet – can you do something with them? Nip & Tuck – add or remove sleeves, straps or belts, change the length or be creative – we can help with that.